Into a cupcake tin, create and add little foil doughnuts inside each cupcake hole, to hold up your eggs. Peel wrappers off eggs and gently cut off tops of the eggs. Set those chocolate tops aside for later. Add each egg into the cupcake tin holes. Make Expressi coffee shot and sit to slightly cool. In a separate bowl, beat cream and sugar until stiff peaks form. Add the cream cheese mixture to the cream and fold through gently. Chop up the almond fingers into small pieces and spoon the coffee over them. Soak for 3 minutes. To build your tiramisu eggs, spoon a small amount of the mixture into the bottom of the eggs. Place the biscuit mixture into the eggs (on top of the cream mixture). Press lightly with a small spoon. With a small spoon (or piping bag) fill the remainder of the eggs with cream mixture. 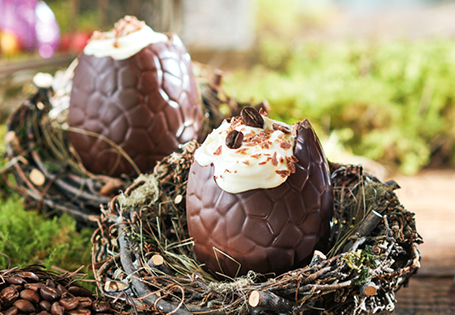 Top each egg with the grated chocolate. Tip: Decorate your Tiramisu Filled Easter Eggs with small coffee beans to serve.